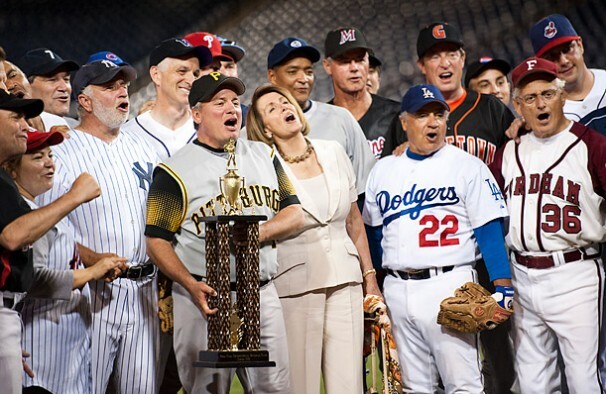 On Thursday night, July 14, America’s elected officials took a much deserved break from trying to figure out what to do with all that debt, and took part in the most American of activities: baseball. The 50th annual Roll Call Congressional Baseball Game was played at Nationals Stadium last week, and, thanks to a pair of well-educated NotGraphs readers, what you’ll find below is a brilliant review of the Democrats’ 8-2 victory, their third in a row since 2009, after they, the rest of the country, and, well, the world, took it on the chin from the Republicans for eight straight — and long — years. Huge political props go out to Dara and Noah for their review. Thank you kindly, and long live the American spirit. Even the participants in the annual Congressional Baseball Game are aware that it’s a slightly pathetic event. The only Baseball Hall of Famer who’s ever appeared in the game, former senator Jim Bunning, is not a member of the Congressional Baseball Hall of Fame, and the game program prominently features a quote from former Congressman Marty Russo calling it “the one thing that’s left where members (of Congress) get to have fun together.” Nonetheless, the 2011 game, played last Thursday at Nationals Park, managed a crowd of a few thousand Congressional staffers, interns, and hometown fans nostalgic for the lovable bumbling of the past few Nationals seasons. But fans on the left-field (aisle?) side were in for a pleasant surprise. The Democrats turned in an impressingly not-incompetent performance, winning 8-2 on the strength of a legitimate gem from pitcher Cedric Richmond. Richmond, a former player for Morehouse College, wore the New Orleans Black Pelicans uniform of his former coach and did it proud. He carried a no-hitter into the sixth inning, and only allowed three balls out of the infield through his complete (seven-inning) game. He struck out twelve. By the tenth K, the Democratic section erupted in chants of “MVP” (though only the more baseball-savvy were chanting “Cedric Strasburg”). Richmond’s arm started to tire in the seventh inning, as he gave up two unearned runs on a bases-loaded HBP and a subsequent wild pitch. But he gave himself some of his own cushion, going 4-4 at the plate, with a double, a run scored, and an RBI. The only question in the minds of the fans was whether he should be slotted before or after Livan Hernandez in the Nats’ starting rotation. On paper, the Republican team should have been able to stand up to Richmond: center fielder Lou Barletta (whose name, in longstanding –Natinals– Nationals tradition, was spelled “Bartletta” on the scoreboard) had once tried out for the Cincinnati Reds, and shortstop Connie Mack IV wore a vintage Philadelphia Athletics uniform to honor his great-grandfather. At the plate, however, the Republicans were players over whom even Jayson Werth would have replacement value, and Mack let a pair of balls pass through his legs in a charming tribute to 2010-vintage Ian Desmond. Neither team’s defense was as bad as one might expect, however. Due to a mix of competent fielding and generous scoring, the teams combined for 4 errors — a marked improvement over last year’s 11. And like their Major League counterparts, the congressmen appear to have learned how to turn a double play. Unlike 1994, when Ohio Democrat Sherrod Brown shattered Ohio Republican Mike Oxley’s hand in a collision at first, no one was injured during the 2011 game. (Oxley, who was attempting to put the tag on Brown, might have avoided the injury had he understood the concept of a force out.) Democrat Bruce Braley broke his arm during the first day of practice, but disobeyed doctor’s orders and played. Somewhere, former Nationals sportscaster Rob Dibble approves. The Democrats scored early and often, leading 6-0 after two innings. In addition to Richmond, Adam Smith hit safely in all four of his plate appearances. And while there are not yet any openly gay MLB players, Democrat Jared Polis became the first gay congressman to hit safely: perhaps the lack of a humidor (as his program bio noted) gave the Coloradan an unfair advantage. Then again, in July, DC is a humidor. Image credit: Time’s Swampland blog. We hoped you liked reading The U.S. Congressional Baseball Game: A Review by Navin Vaswani! Aww, no mention that Linda Sanchez (second from the left in the supplied picture) was wearing jersey number “Title IX”. My friends and I got a great kick outta that one.